Oxbow Critical Care Fine Grind is a premium recovery food that can be fed to herbivores that are unwilling or unable to eat their normal diet due to illness, surgery or poor nutritional status. The specially formulated product contains high-fiber Timothy Hay and the essential nutrients to ensure proper gut physiology and digestion. 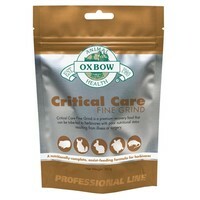 Oxbow Critical Care Fine Grind has been designed to be used through feeding tubes as well as through traditional means. My rabbit has chronic intestinal problems, and this Critical Care has been a great help. The only problem is, that my rabbit HATE the taste 😉 It has done wonders!